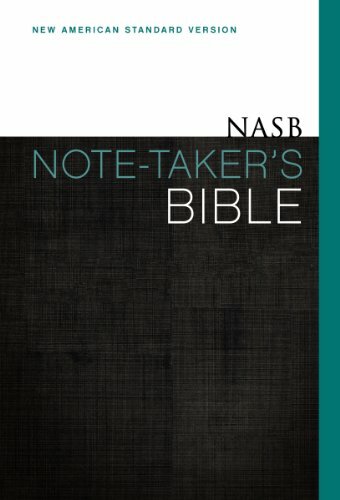 Zondervan’s NASB Note-Taker’s Bible enters into a new area of Bibles specialized for use in congregations and devotional study. Intended for the Christian who is seeking larger margins in their Bible, the concept is attractive and practical. By removing study notes and references, Zondervan presents a Bible ready for the most meticulous and extensive note taker. The Note-Taker’s Bible in its physical form is excellent. The hardback edition here reviewed remains thin enough to be easily transferred and carried for congregational use. Though significantly longer in length, the width of the Bible is not significantly expanded beyond a standard compact or thinline Bible. This added width is from a mild upgrade of paper quality over the standard Bible. This upgrade does not eliminate bleed caused by ink pens from note taking. In terms of inward reading experience, the Note-Taker’s Bible is the exact printing of the NASB Skinii Bible and Thinline Bible except on larger paper. The font, paragraphing, and page numbers are all entirely the same as these much smaller and thinner Bibles. Though this does provide ample room for note taking in the margins and at the bottom of each page, it also strikes one as awkward. Simple formatting lines around the Scriptural text, or perhaps a lined area for note taking would make this Bible feel like time and effort had been put into it. Despite its pragmatic design, the Bible does not give the indication of being crafted for this usage. In conclusion, Zondervan’s NASB Note-Taker’s Bible is efficient for the task. Despite multiple areas where the Bible could be enhanced, avid note takers will find ample amounts of writing space without a cumbersome Bible experience. This hardback edition will certainly sit well in a reader’s lap and be conducive for attentive study of the Scriptures.